When looking at the statistics for eye injuries caused by DIY, the figures can be quite scary. DIY causes 30,000 eye injuries EVERY YEAR in the UK alone. The most common causes of eye injuries to adults are through flying chips of wood and metal. These injuries can lead to vision loss, permanent damage and even blindness. Given these risks it’s surprising how many people aren’t fully aware of the importance of proper eye protection or quite often wear no protection at all! People often think that safety spectacles are only available at work, and are very surprised when they find out that the can buy their own. A lot of injuries occur when the eye protection is lifted to take a closer look, which is why they are made in bifocal or varifocal form if that is needed. Now, I can bet we all remember our dads or granddads pottering around their garages having pimped up their ordinary glasses into ingenious ‘safety glasses’. This usually amounted to a pair of glasses with bits of cardboard attached to the sides! Just take a look at these wacky inventions! While we can look back on this and laugh, such inventions cannot equal the essential protection given by properly made and tested safety glasses that meet all the personal protective equipment (PPE) guidelines. And hands up those of you who wear your safety glasses over the top of your prescription pair? It may seem silly, but this can severely compromise the performance of the safety glasses and this practice must also be avoided. Make sure your safety glasses are in good condition and in working order. Non-prescription or overspex: These have the appearance of ordinary prescription glasses but have the added protection of reinforced lenses and frames, rather like your car windscreen is designed not to shatter on impact. These glasses are useful around flying particles. Prescription Safety glasses: These have the appearance of ordinary prescription glasses but have the added protection of reinforced lenses and frames with side shields, designed not to shatter on impact. These glasses are useful around dust and flying particles. Goggles: Goggles give protection all around the eye area and are impact resistant. These can be used over the top of your prescription glasses and protect from any direction. Face shields: Face shields should be used alongside goggles or protective glasses to protect from chemical splashes, heat and flying sparks. Special filters: Glasses with special filters in the lenses can be used to protect against blue light, UV rays and for when working with lasers. Always remember, the majority of eye injuries ranging from simple eye strain to severe permanent damage could have been avoided had the victims only been using the correct protection for their eyes. Your vision is precious, look after your eyes by being constantly mindful of the risks around you, wearing and taking care of your eye protection. 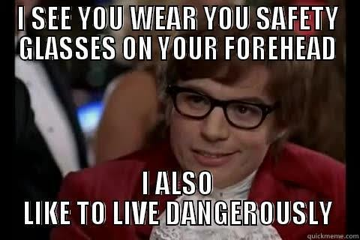 Taking Care of your Eye Protection. 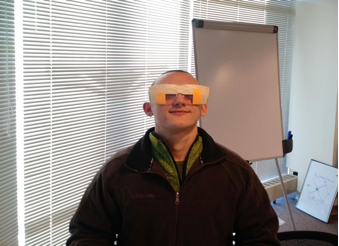 As well as wearing it, it is important to make sure you check your protective eye wear before and after every job. When not in use, your eye protection should be stored in an appropriate container. Scratched or cracked lenses should be replaced immediately. Above all, make sure your protection fits correctly. Firmly but not tightly! In following all of the above advice, everyone should be able to enjoy their DIY escapades (successful or not!) safe in the knowledge that their vision is well protected from any eventuality.